For most people, their favorite Holidays are usually Halloween, Christmas or their Birthdays. But for me, I always look forward to Thanksgiving. I love everything about it. Being with my family. Sharing memories. Laughing until your stomach hurts. Creating new recipes and sharing old ones. Which brings me to a family recipe that will surely be a Thanksgiving favorite in your home, Ensalada de Oliva y Camarones which in English means an Olive and Shrimp Salad. I truly owe it all to my mom and Mezzetta, they helped create one of my favorite dishes. I remember the first time my mom made Ensalada de Oliva y Camarones. I was a teenager and wanted to help out in the kitchen. She showed me to how peel shrimp and that was my job. I was totally disgusted. Just typing this memory puts a smile on my face. But at the time, I was so grossed out. I peeled all the shrimp and she put it all in a pan. Next, she cut up Mezzetta Pimento Olives, Scallions and Cilantro. Added some Olive Oil and mixed it all together. It's as easy as that, however her secret for a more flavorful dish was adding the juice from the Mezzetta Pimento Olives and letting it all sit for a few hours in the refrigerator before serving. Every Thanksgiving we make this dish and I always look forward to peeling the shrimp and cutting everything up, especially the Mezzetta Pimento Olives. This is a memory I will always look back on when I'm making this recipe. And this year, I plan on making Ensalada de Oliva y Camarones with my daughter, who like myself loves helping in the kitchen and is so interested in everything going on. 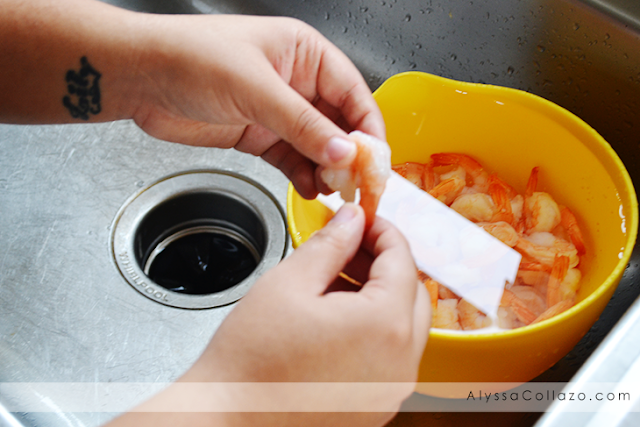 Just like my mom showed me how to peel a shrimp, I will show my daughter. I get to relive old memories and make new ones at the same time. 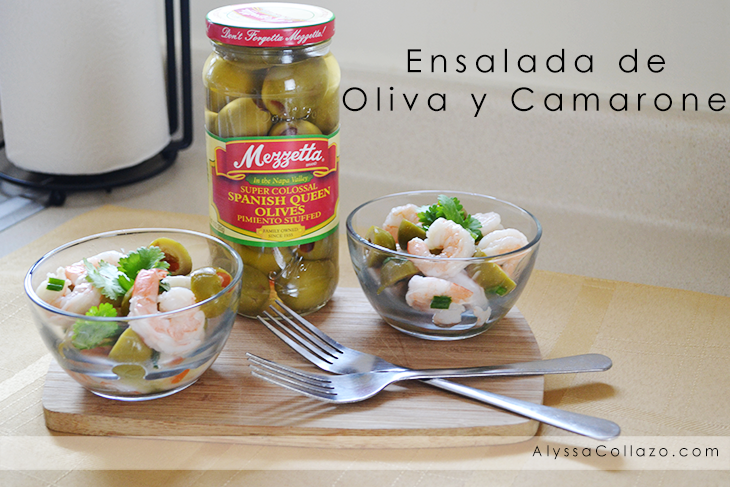 Ensalada de Oliva y Camarones is easy to make. It's full of flavor and oh so good. Here is the full recipe. Y ahí lo tienes! And there you have it. A delicious Thanksgiving side, full of flavor and color. But, before you go, I have some exciting news about Mezzetta and their Holiday Memories Sweepstakes, if you love food or if you just like to win some great prizes. This would be a great gift for yourself or someone else. • Grand Prize (1) – Instant Print Digital Camera plus a Ultimate Olive Lover’s Gift Basket including Mezzetta Olives, Olive Spoon, Cutting Board, Olive Bowl, Cocktail Napkins and Recipe Card. • Runner Up Prizes (10) – Ultimate Olive Lover’s Gift Basket including Mezzetta Olives, Olive Spoon, Cutting Board, Olive Bowl, Cocktail Napkins and Recipe Card. Expires : December 31. Winners are Chosen at Random and will be notified and will receive prize within 2 weeks. 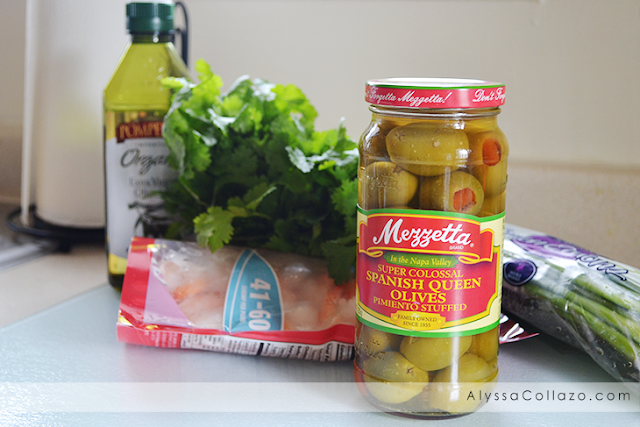 Do you have any Mezzetta inspired recipes? You out did yourself, looks amazing. This looks really yummy! 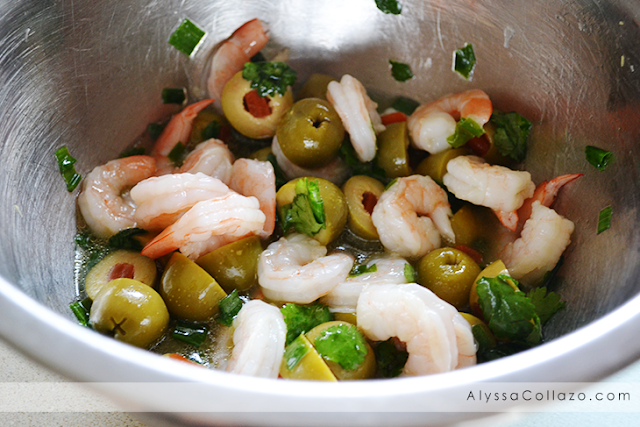 I love the cilantro and shrimp combination, and you pretty much can't go wrong with yummy olives. That looks super tasty. I can't wait to try this. You've shared something fantastic here! I could eat those olives right out of the jar. Your salad looks so tasty and incredible, I'll have to try it soon. That looks delicious! I am not a fan of cilantro, but this is worth giving a try. Looks good, I never thought to put shrimp and olives together. I also live a quick meal. I am not an olive person, but my son LOVES them. He has never tried green olives, I wonder if he would like these. Oh wow...this shrimp salad looks amazing!!! I am usually not an olive fan but they look amazing in this recipe!! Oh yum! My family would love an awesome shrimp dish like this. This combination sounds amazing. I love cilantro and shrimp... now I'm thinking about my favorite shrimp tacos. MMMMM. I don't really love these olives, but I do like the Kalamato (spelling?) ones in greek salads. Yum. While I don't eat seafood, this is an awesome idea of mixing foods! I would have never thought to put olives and shrimp together. I love olives like these! I don't normally put them IN a recipe - but love to have them out for canapes all the time!! The recipe you shared looks delicious and easy to prepare. I'm going to save this one to try it one of these days. Thanks! I never would have thought to pair these ingredients but this sounds delicious! Hopefully my husband thinks this looks as good as I do. I would have never thought of this combination, but now I have to try it!! 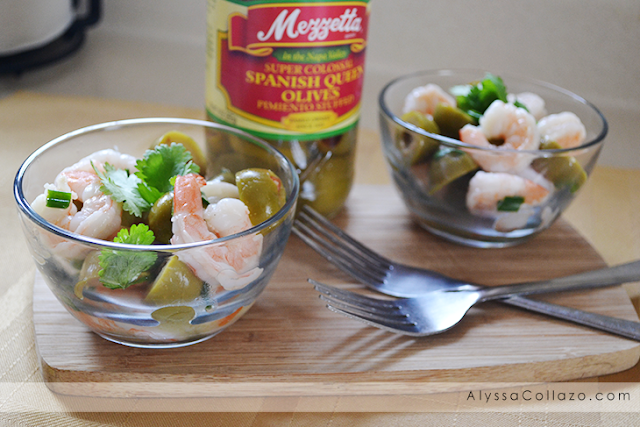 Mezzetta olives are just the best and I am sure that they pair nicely with the shrimp!! YUM!! Those olives are pretty tasty looking. Good tip too, not to drain them. Oooo this recipe looks so delicious!!! Definitely going to have to grab some supplies and make some! I love olives in salad, with pickles and cheese, plus by themselves. I could eat them all day! This looks so good, now I am hungry! Olive and shrimp salad? I feel like the world is playing a cruel trick on me... two of my favorite foods in the same dish? Im dying to make this! This looks like something my husband would love! 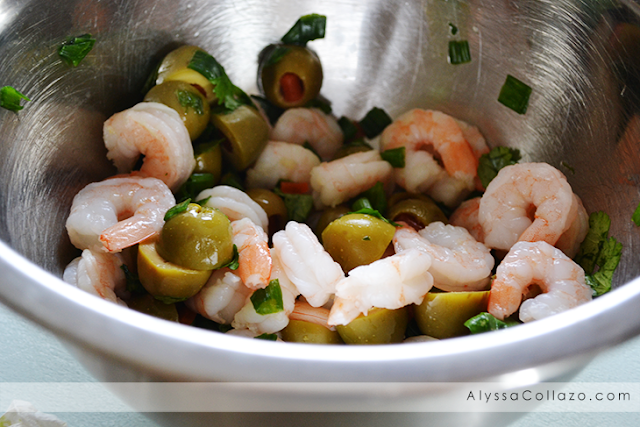 He loves olives and shrimp so combining them would be a treat! Anything with shrimp is for ME! Obsessed with how easy it is to make this dish! What an awesome sweepstakes! My hubby loves olives! I bet he would love this dish. That looks so yummy! I can't wait to try and make it!